You're name is RoboAvian, you are a Fortuna fanatic and a new streamer, so new you made possibly one of the worst mistakes to make as a streamer, you forgot to start the stream. You had just picked the Ship and AI, and made your first crewmember, without realizing you hadn't started the stream. You go ahead and quickly start the stream, after all if you decided to not do it now you might never do it. RoboAvian:Hey guys! Sorry I forgot to start this up, I had promised to do one so I'm sorry if you thought I wouldn't(also I will probably be mainly talking here, my throat feels sore today) Anyway, this is a playthrough of Fortuna with a mod I had installed, it's called "Robots Galore", and it basically made it so that at least one of your starting crewmembers besides the ship AI have to be a robot of some sort, and at most half of your crew can be robots. Also you will encounter at least one robot on each planet, and one thing that honestly I think was a little much was they made it so you can add 5 stat points to each of your starting robot crewmembers. It came with this cool layout too, so that's nice. Anyway, if you have any questions, go ahead and ask them, and you guys will help me with a few choices! Also if this is your first time talking on this you have to tell me your name so I can put it in or else it will just call you all "Anonymous1" or "Anonymous2", so anyway yeah! 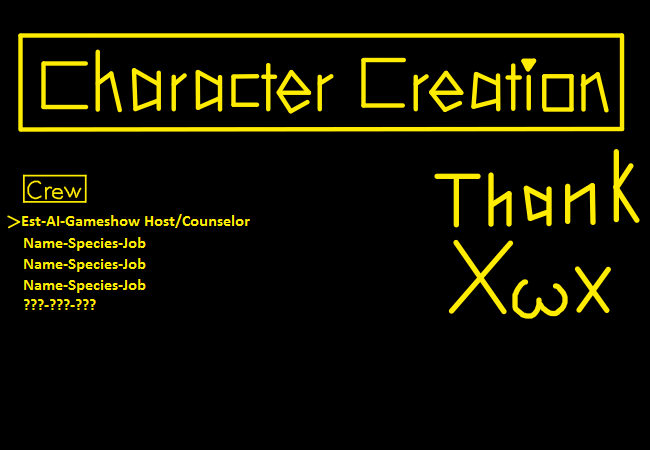 Also this is the crewmember I made. 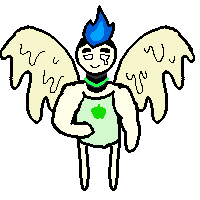 Bio: Jujube used to be a matchmaker, just like all the other Cupids, until she discovered that she had a terrible blessing placed upon her; those Jujube paired would end up perishing together in horribly unlucky accidents. Jujube swore off matchmaking, and now works as a sort of cheerleader for hire. She is going to Fortuna to try and lift this blessing. Bio: The notails making this v26 Somnus messesd up somewhat. You see, this Somnus sees things from a different point of view. Where most would get, say, a boring office job, Boop would look at that, and say “Why? 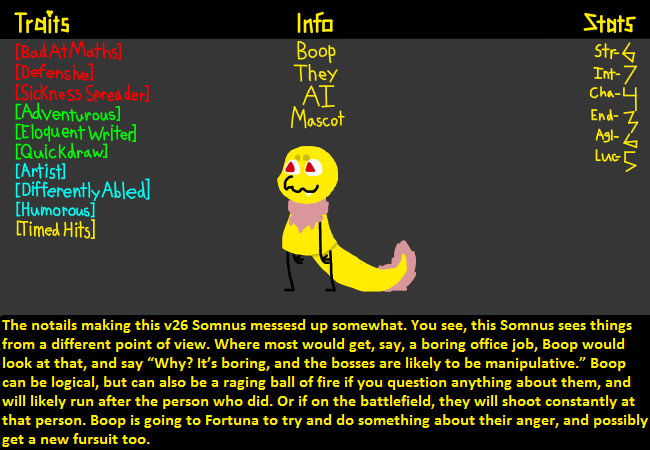 It’s boring, and the bosses are likely to be manipulative.” Boop can be logical, but can also be a raging ball of fire if you question anything about them, and will likely run after the person who did. Or if on the battlefield, they will shoot constantly at that person. Boop is going to Fortuna to try and do something about their anger, and possibly get a new fursuit too. Bio: Esbarzer, "Thornbush" in an obscure language, was a Coeus unit designed to contain top secret knowledge by the Notail goverment and to self destruct if it was ever released, making him a bit more charimatic and frail than most other AIs of his type. Unfortunately for him, he was discarded and sold, where he made a life of its own as a navigator. Still fearful of his eventual demise implanted too deep in his programming and behind a lot of notail security, Esbarzer has decided to test Fortuna to see if the self destruct code can be erased. 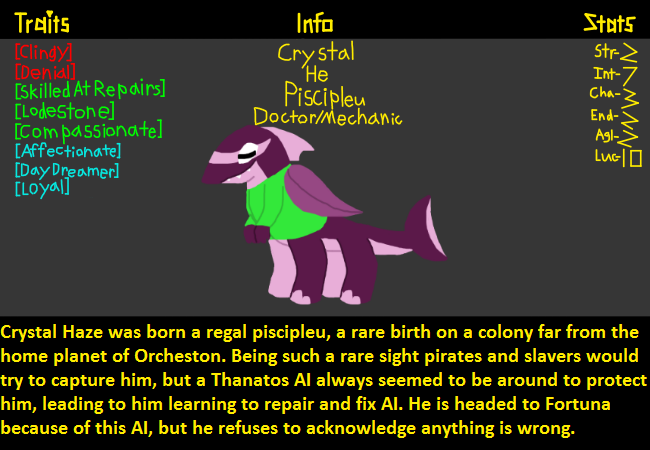 Bio: Crystal Haze was born a regal piscipleu, a rare birth on a colony far from the home planet of Orcheston. Being such a rare sight pirates and slavers would try to capture him, but a Thanatos AI always seemed to be around to protect him, leading to him learning to repair and fix AI. He is headed to Fortuna because of this AI, but he refuses to acknowledge anything is wrong. Since only one AI submitted character is permitted, I’m changing my Coeus with this robot like character. Bio: Tarraco has spent most of his youth as an engineer for hire in multiple ships and crews, most of them with questionable intentions. Thanks to him, many pirates have gotten away with many important thefts, and the notails have a petty bounty placed on his head. 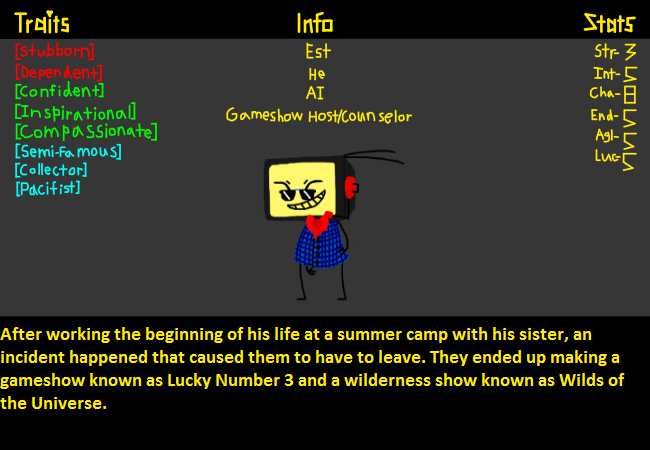 But now he's old and doesn't want to die when the universe has so much to see, so he will gladly join any crew going to fortuna to fulfill his dream he has many times attemped to happen: becoming an unorganic robot. Well it says up to half...so 2.5 characters can be ai. RoboAvian:Oh! Right! I chose my starting ship and AI as Artemis, and I tried to make Est's description so it would be the Artemis is his sister, but hopefully it will work that way, also in my last game one of my crewmembers wished for a way so everything would roll in their favor, and I guess Fortuna was having a good day and gave them the Fortuna Dice! So that's pretty cool! :I do hope the Artemis is his sister then! And wow, Crystal turned out really amazing. :Ok but consider Getting more Boogs, Boogs are cool. lol sure hope nothing actually goes wrong then. I've heard about putting AIs and stuff in bios to get them to appear, never seemed to work properly for me tho. But idk about a Thanatos, maybe you'd be better off not meeting it. Also im ten11, I like sticking solar panels on ships and waiting for them to charge rather than finding fuel and i think that says all you need to know about my playstyle. : yeah that'd be pretty awesome if the game has your Artemis as Est's sister!! :Oh I just realized what you were talking about. I mean the game could interpret it differently, but he refuses to admit anything is wrong with his friend. To be fair that could also lead into anyone else he cares about going missing. Moth:I do hope the Artemis is his sister then! And wow, Crystal turned out really amazing. RoboAvian:Yeah, I really like having siblings being crewmates, I just really like to know they can have eachother's backs, and thanks! I really admire how the devs were able to give so many options for character creation! BoogFan555:Ok but consider Getting more Boogs, Boogs are cool. RoboAvian:...Boogs? Bugs? What? Is this a Fortuna term I don't know about? RoboAvian:Yeah, once again I REAAALLY like to have siblings on the crew, and yeah, I do a lot of weird too, mainly with, uh, how I make my crewmates interact with things... but ye! Moth:@ten11 Oh I just realized what you were talking about. I mean the game could interpret it differently, but he refuses to admit anything is wrong with his friend. To be fair that could also lead into anyone else he cares about going missing. RoboAvian:yeah, but let's hope that doesn't happen, seeing how Crystal has the [Clingy] trait, some bad stuff could happen if that was the case, but anyway it was really nice to meet all of you! Hopefully we'll get some new viewers soon. :Watch out this Boop knows about timed hits. (09-04-2018, 11:50 PM)Kenshiago Wrote: » :Watch out this Boop knows about timed hits. :Boogs are one of the species in fortuna that look like small hard light projectors with wheels, next to that is the hard light projection wich has neon colors everywhere and look like a mish mash of other species, they act like spambots and are the best. Also a submission of a boog i guess. A Ex-Conman who just got tired of people who were skeptical about his abilities. Being a Very [Greedy] Person, he mostly only cares about money and wealth, being from a formerly poor family he set his goal to go to fortuna and gain INFINITE WEALTH. His current job is to haggle shop prices for the crew, very likely to succeed due to his high charisma.